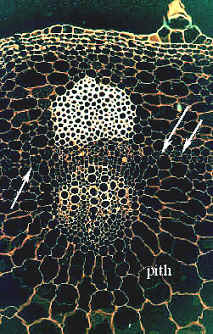 This micrograph shows part of the stem of Helianthus, just at the onset of secondary growth. The interfascicular zone (unlabelled arrows) is beginning to produce interfascicular cambial cells. 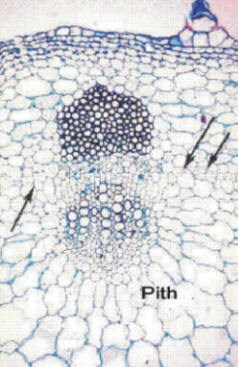 The lignified primary phloem fibers which cap a relatively small area of functional phloem tissue is easier to see in the negative image below.